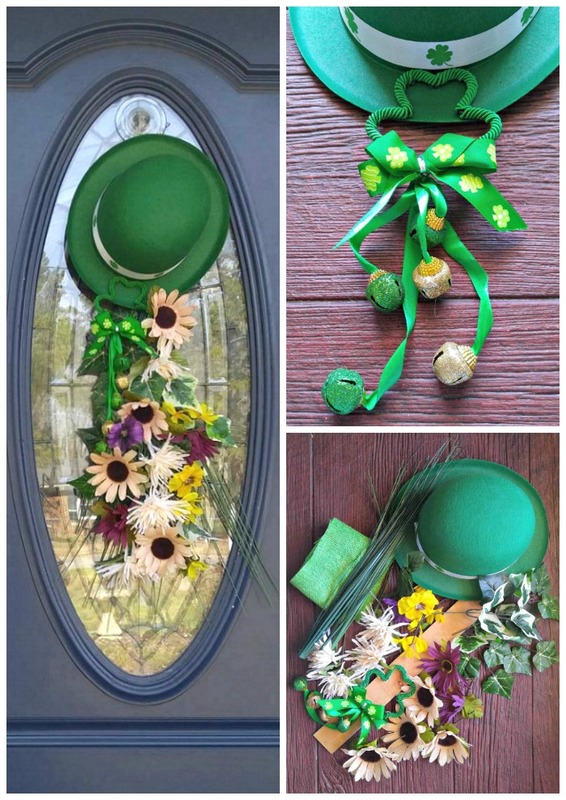 This cute St. Patrick’s Day Door Swag is whimsical and welcomes both my guests and spring with the pretty yellow and purple flowers. It’s a great idea for doors that won’t fit a wreath. My front door is one place that I decorate pretty much year round. Even when I don’t decorate inside the house, I still like to welcome guests in a pretty way on my entry. Recycling is my middle name when it comes to my craft projects. I use my supplies over and over again! The sunflowers on this door hanging have been in so many other projects. I love the look of them and just keep taking apart previous projects to fashion them into something new. I think this may be their last project, though! The stems are pretty short now. 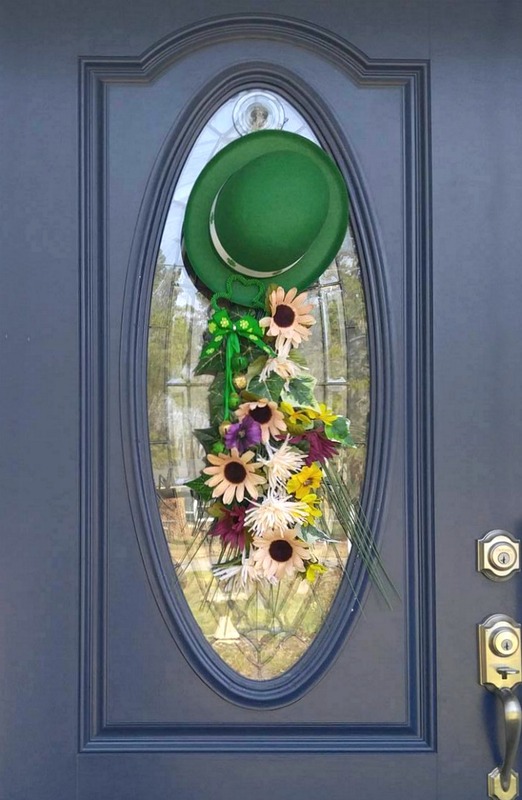 On a recent shopping trip, I found a cute leprechaun hat and a shamrock with attached bells and I knew just how my my front door would look in March! I have an oval glass panel on my front door, so a normal wreath doesn’t work for me. I always make door swags instead. Here is how I made my St. Patrick’s Day Door Swag. 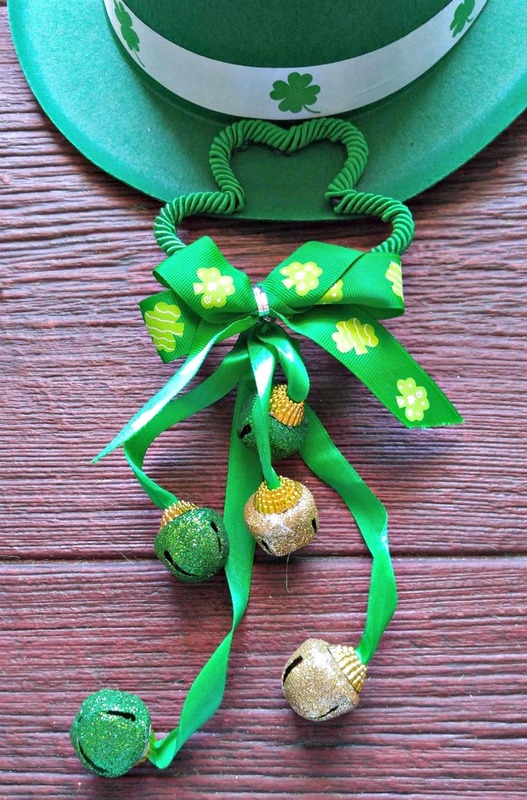 A green felt leprechaun hat. 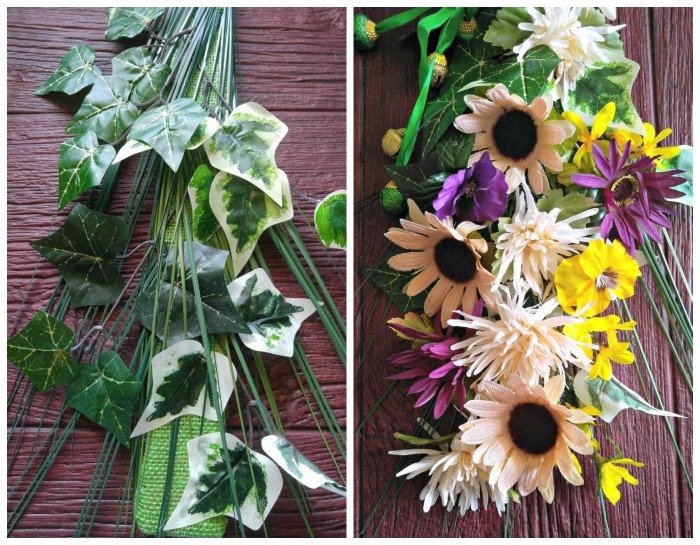 Silk flowers and Greenery – I used sunflowers, Ivy, onion grass, pansies and forsythia. Burlap is a great material to use in wreaths. For this project, I started by covering the plywood with the burlap fabric and tack it in place using the hot glue. Open up the onion grass sprigs and flatten them out. 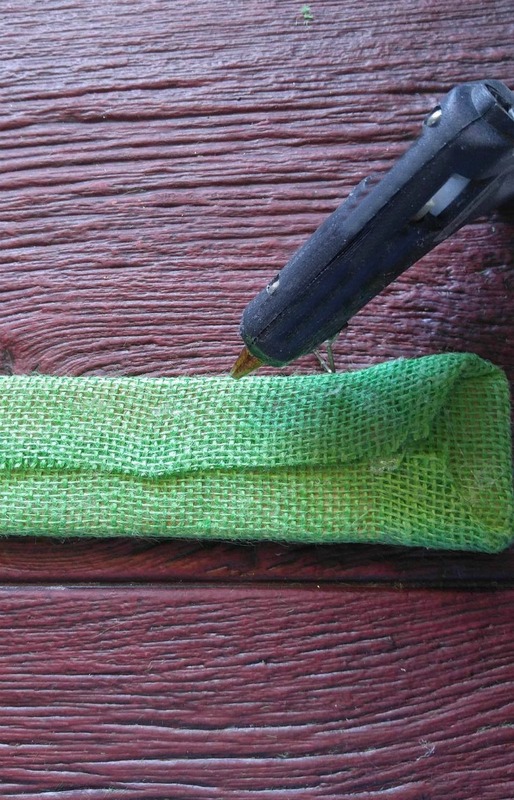 Lay them on the covered burlap to make a base for the swag, then attach with hot glue. Attach the greenery by gluing the ivy so that is fans outward evenly on both sides, and then hot glue the flowers in place. There is no set way to do this. I walked back and forth to the front door to see how it was coming together. Just keep attaching until the look of it is pleasing. Time to add some Irish Charm. Hot glue the shamrock and bells in place on the brim of the hat on an angle. The bells will hang down and make a sound when the door opens and closes. Hot glue the hat in place at the top of the plywood piece and thread a piece of fine gauge wire through the hat brim under the ribbon so that it is hidden. Make a loop with it and hang it on a glass door hanger. Here is the door swag on the front door. I love the way it looks, don’t you? My front door is so much fun to decorate for all the holidays. See my Easter door swag here. More Fun St. Patrick’s Day ideas. 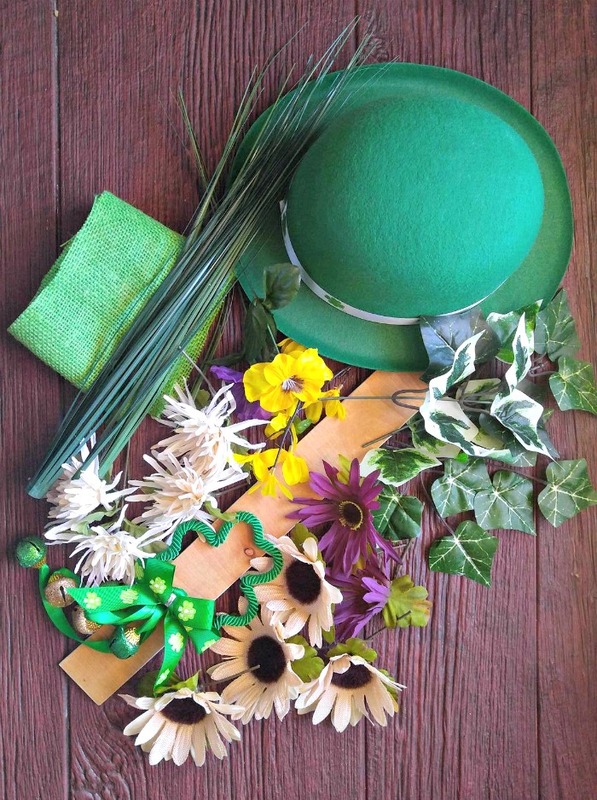 For more fun St. Patrick’s Day projects, visit my St. Patrick’s Day Board on Pinterest. Do you like door swags as much as I do? Here are a few more ideas that are perfect for spring. I might use them as inspiration for my next project. Would you like a reminder of this door swag for St. Patrick’s day? Just pin this image to one of your holiday DIY boards on Pinterest. 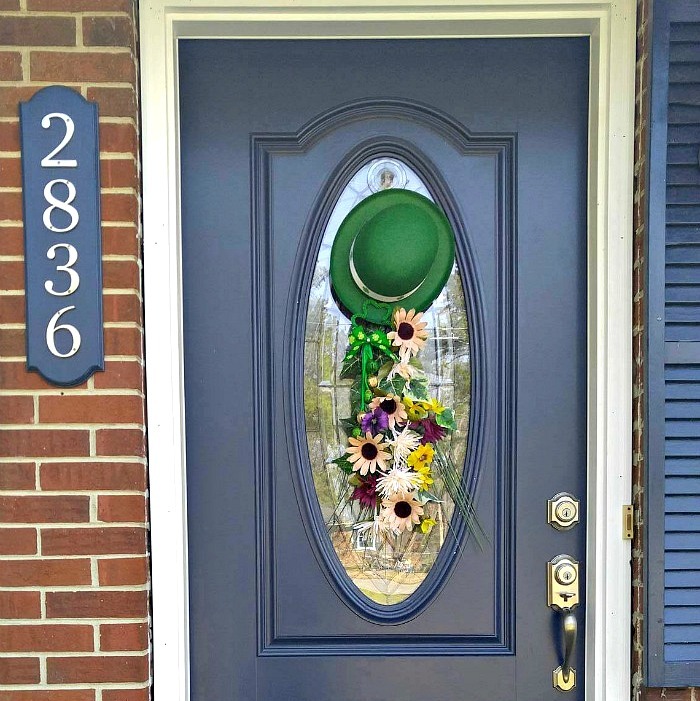 Admin note: This post for the St. Patrick’s Day door swag first appeared on the blog in February of 2017. I have updated the post to add a printable project card and a video for you to enjoy. 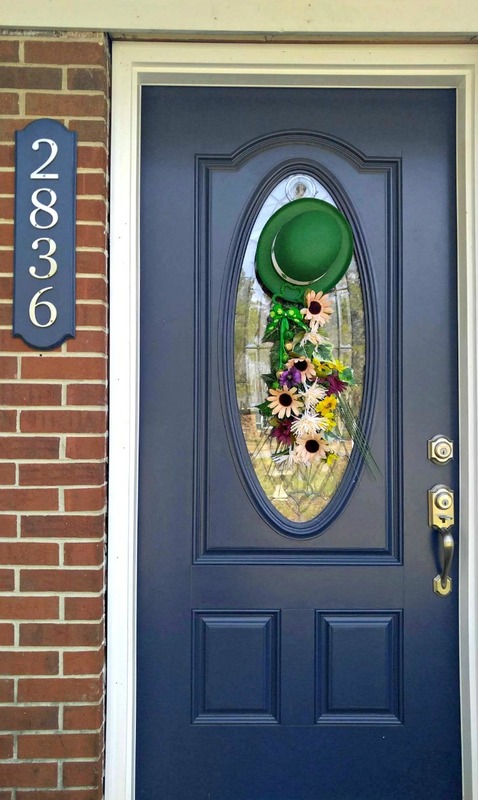 St. Patrick's Day Door Swag Welcomes The Luck of the Irish! 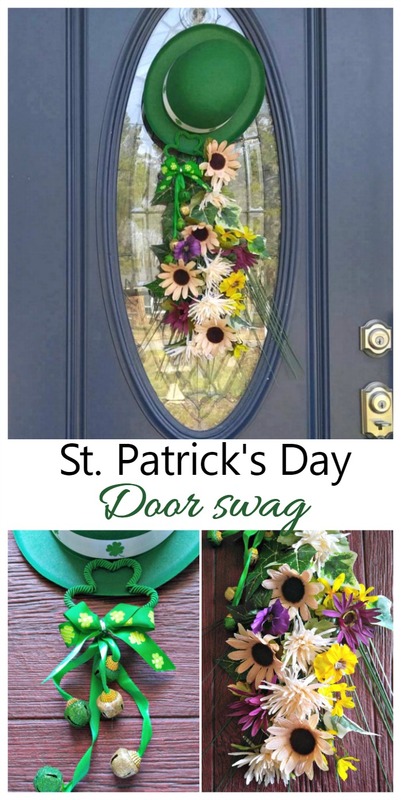 This cute St. Patrick’s Day Door Swag is whimsical and welcomes both my guests and spring with the pretty yellow and purple flowers. Silk flowers and Greenery - I used sunflowers, Ivy, onion grass, pansies and forsythia. Piece of plywood about 2" x 24"
Piece of green burlap fabric 4" x 28"
Cover the plywood with the burlap fabric and hot glue it in place. 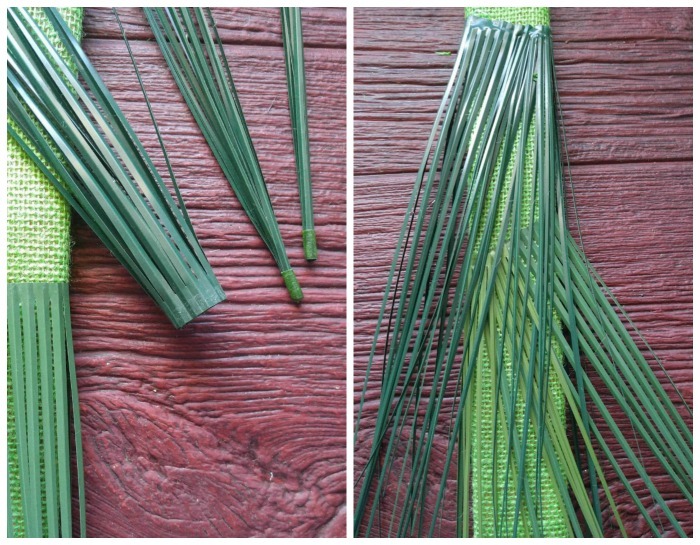 Separate the onion grass and open it up and attach to the covered fabric. Hot glue the ivy first and then the flowers. Attach the shamrock and bells to the hat on an angle and then attach the hat to the top of the plywood. Poke a couple of holes in the brim area of the hat and thread the fine gauge wire through and make a loop for hanging. Attach to the front door.